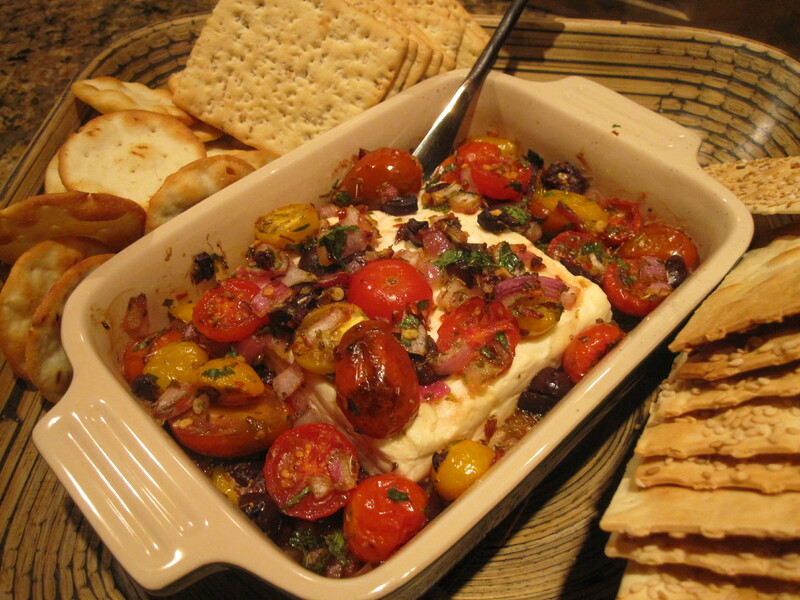 Baked Feta with Tomatoes and Olives | eat. cook. blog. Anyway, I love Sam’s version so much, I knew I wanted to try this. So made it for an appetizer last night and it was a hit. It was devoured. I laughed when I re-read SK’s last sentence below, “as it cools, the feta will firm up again. We found that the dish could be returned to the oven to soften it again. We did this with leftovers, too” because it was gobbled up so quickly it never had a chance to cool and there was not a smidgen left over! Heat oven to 400°F. Check to see that your dish is oven-proof. Place the block of feta in the middle of your dish. Pile the tomato mixture on top of the feta.